Fargo, North Dakota (March 13, 2019)--As outdoor temperatures increase, stored grain requires attention to prevent losses, says Ken Hellevang, North Dakota State University Extension agricultural engineer and grain drying expert. 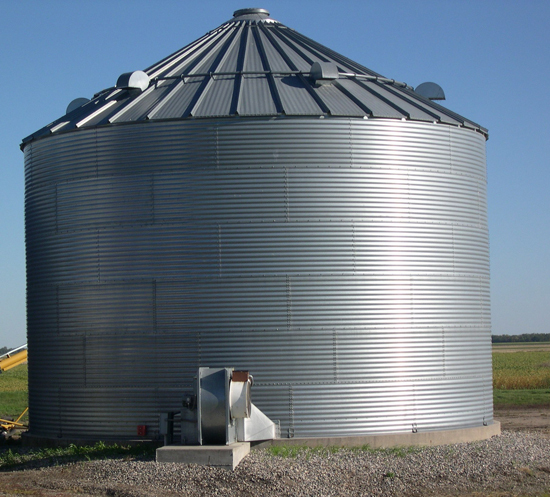 � Corn - For natural air-drying, assure that the fan�s airflow rate is at least 1 cubic foot per minute per bushel (cfm/bu) and the initial corn moisture does not exceed 21 percent. Start the fan when the outdoor temperature averages about 40 degrees. � Soybeans - Use an airflow rate of at least 1 cfm/bu to natural air-dry up to 15 to 16 percent moisture soybeans. Start the fan when the outdoor temperature averages about 40 degrees. Follow the manufacturer�s recommendation for high-temperature drying soybeans. Monitor the soybean quality and reduce the drying temperature if excessive cracking or splitting occurs. � Sunflowers - Natural air-drying for oil sunflowers requires an airflow rate of 0.75 cfm/bu for up to 15 percent moisture. The drying should start when outdoor temperatures average about 40 degrees. � Wheat - Use an airflow rate of at least 0.75 cfm/bu to natural air-dry up to 17 percent moisture wheat. Start drying when the outside air temperature averages about 50 degrees. � Barley - Use an airflow rate of at least 0.75 cfm/bu to natural air-dry up to 16 percent moisture barley. �Also, everyone needs to become aware of safety hazards associated with handling grain and to apply recommended safety practices,� Hellevang stresses.